If you’ve taken a gander at Jim Carrey’s Twitter account over the past year, then you know it includes just about everyone in the Trump administration being brutally mocked via Carrey’s drawings. (The newest addition, which he posted during his panel at Vulture Festival? An unflattering depiction of Mitch McConnell on a turtle’s body.) Aside from skewering politicians on canvas, Carrey also just debuted his first solo show at the esteemed Maccarone Gallery in Los Angeles. 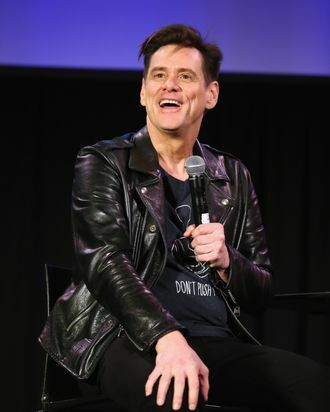 However, as Carrey noted at Vulture Festival on Sunday, his management was initially skeptical that making his drawings public would be a good idea for his career — advice Carrey immediately scoffed at. This post has been updated to reflect Carrey’s comments more accurately.